Guests from the Russian and Romanian Orthodox Church attended on Sunday the mass served at Alexander Nevsky Cathedral on the occasion of the 39th year since the enthronement of Maxim, Patriarch of the Bulgarians and Bishop of Sofia. Maxim, a former Bishop of Lovech, was enthroned as the head of the Bulgarian Orthodox Church on July 4, 1971. He was born October 29, 1914, in the village of Oreshaka, Central Northern Bulgaria, and is currently aged 95. Patriarch Maxim has received greetings from Bulgarian President Georgi Parvanov on the occasion of the 39th year since his inauguration. “In your face, our Holy Church has an impeccable pillar, our nation – a spiritual leader, and each and every one of use – your fatherly love and wisdom. You achieve all that “in pureness, in knowledge, in long suffering, in kindness, in the Holy Spirit, in love unfeigned,” states the greeting letter of the Bulgarian President including a quote from Apostle Paul from Corinthians 6:6. Patriarch Maxim is known to have been in good relations with Bulgaria's communist dictator Todor Zhivkov, and to have been approved by the Bulgarian Communist Party for his appointment as patriarch. 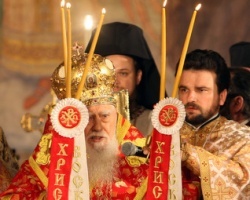 This has led to a division of the Bulgarian Orthodox Church after the fall of the communist regime in 1989, and the creation of an alternative Holy Synod. The Bulgarian state and other Eastern Orthodox Churches have backed Maxim as the head of the Bulgarian Orthodox Church, and have refused to recognize the alternative synod first led by Bishop Pimen, and then by Bishop Inokentiy.